Launched in 1998, the RX 350 is one of the longest running sport-utility vehicles available. Loved by many, the RX keeps working at getting better. But â€˜betterâ€™ isnâ€™t necessarily what all drivers want. The RX does most things well however, we werenâ€™t as starry-eyed about the 2016 â€œimprovementsâ€ as some. Still versatile, still comfortable and full of luxurious amenities, the RX just doesnâ€™t do anything for us. Word has it that Lexus was trying to make the RX more like the competition, which sounds paradoxical since most other SUVâ€™s are wanna-bees when it comes to the Lexus. Nevertheless, it seems Lexus for 2016 was aiming at a vehicle more sporty, edgy and attractive to younger buyers. The RXâ€™s new front end wonâ€™t appeal to just everyone; in fact, listening in on conversations regarding same, many donâ€™t like it. 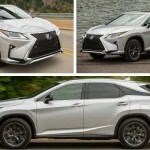 Designed with many more angles and edginess, the 2016 RX-like its stablemates, The 8-speed gearbox does help improve fuel economy, and for a vehicle this size, 20/28 mpg for the front-wheel-drive version is commendable. The all-wheel-drive version delivers 19/26 mpg. You will recognize the 2016 RX 350 right away; mostly because of its new grille-so large you canâ€™t miss it, but also due to the many angles and curves. The high beams, low beams, and taillights are LEDs; and LED driving lights and rear turn signals can be added as an option. Our test car had the available 20-inch wheels, which are available in two designs, including one that offers a choice of four different inset color treatments. They are handsome. This yearâ€™s RX has been increased by 1.4 inches in length, and 1.9 inches in width. It is noticeably larger. The interior is as plush as always, with added features and updates. Quality has been updated and new color treatments havfe been added, including dark brown and red. The display is a whopping 12-inch screen. On the base RX, the rotary controller with the mouse remote touch unit is standard. We got used to this over the years and prefer it to having to reach up to a knob. As with many vehicles today, drivers have a choice of Eco, Normal and Sport modes of driving experience. The RX adds a Sport+ mode on the F Sport and EV mode on the RX 450h. For those opting for a hybrid version of the RX, the powertrain is a combination of a 3.5-liter V-6 and an electric motor. On the AWD hybrid models, Lexus adds a second electric motor to power the rear wheels. Fuel economy is estimated at 31/30 mpg. on the rear-wheel-drive version; the hybrid all-wheel-drive at 30/28 mpg. Standard in all RX350 models, not just the F Sport. The eight-speed gearbox helps improve fuel economy to 20/28 mpg for the front-driver, while the all-wheel-drive version is expected to return 19/26 mpg. The V-6â€™s 295 horsepower and 267 lb-ft of torque are respectable, but the RX really provides no incentive to hurry. The RX retains its heavily boosted steering and plush ride that will be instantly familiar to current owners. Alas, the soft ride comes at a cost of plentiful body motions over lumpy pavement and generous lean in corners. Our choice in the RX would be the F Sport (available since 2013), although not near as â€˜sportyâ€™ as we would like; think performance. The Lexus is just too luxurious to be competitively sporty. For that we would direct you over to BMW or Audi showrooms. One of the added features to the 2016 F Sport is adaptive varialbe dampers. The drive-mode knob has also been switched to Sport+, offering a firmer suspension. Other F Sport additions include enhanced lateral support in seats, unique grille treatment, 20-inch wheels, and packages containing more equipment. The power liftgate is a new feature for 2016. One needs to just wave her hand at the logo on the hatch and wa-la. Our favorite feature is the Mark Levinson audio system (with Clari-Fi technology). Our test vehicle came equipped with quite a few options, including Blind Spot Monitor w/rear-cross traffic alert and panoramic view monitor ($1,300), Lexus Safety System and Adaptive front lighting system headlamps ($1,050), Heated and ventilated front seats ($640), Panorama moonroof ($1,600), Nav system with 8-inch multimedia display, Lexus Enform Destinations 1-yr. Subscription, Lexus EnformApp suite ($1,750), and the Luxury Package (semi-anline leather-trim seats, power-folding Electrochromic heated outside mirrors, wood and leather heated steering wheel and shift knob, 20-inch alloy wheels, w/color inserts, rear door seat /steering/mirror memory, illuminated scuff plates, Sapele wood w/aluminum trim, LED ambient illumination, rain-sensing wipers ($4,610). That is a lot of costly options. Those who arenâ€™t interested in the slightly crisper driving experience of the F Sportâ€”those legions of repeat buyers, perhapsâ€”might well want to know about the newly available features on the latest RX. The power liftgate can be opened simply by waving a handâ€”or an elbowâ€”at the Lexus logo on the hatch. The Mark Levinson audio system adds so-called Clari-Fi technology that claims to restore much of the sound quality lost in compressed digital music (like that on your smartphone). The RX also bolsters its roster of electronic driver aids with the addition of lane-keep assist, automatic high-beams, and pedestrian detection for the forward-collision warning/automated-braking system. Blind-spot warning now comes with rear cross-traffic alert, and a new 360-degree-view monitor is optional. No question, as each year goes by, Lexus adds more to its now famous RX 350 SUV. They have upped the ante with luxury equipment, making the cabin ultra deluxe, and a list of standard features to rival all others. Although still ultra-luxurious, this writer didnâ€™t enjoy driving the fourth generation RX as much sa past iterations. We found it offered a harder ride, was big and lumbering, compared with smaller SUVâ€™s.The jury is out regarding the controversial front end; many donâ€™t like it. Hard to miss with a Lexus model, no matter the choice. You know youâ€™re getting the best of the best and great resale. Reliability is always a sure thing. Competition for the LX350 is stiff and includes Porsche Macan5, BMW X3, Mercedes-Benz GLC, Lincoln MKX, Land Rover Discovery Sport and Audi !5, among others. Still leading the pack though, the RX 350 is-and remains-ever popular. EPA fuel tank capacity: 19.2 gal.